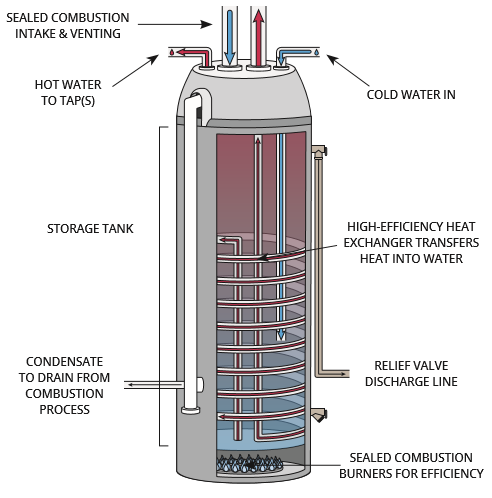 What are condensing storage tank water heaters? An ENERGY STAR® certified storage tank water heater with condensing technology operates much like a conventional gas hot water tank but with technology enhancements designed to increase energy efficiency and durability. A condensing storage tank water heater offers a ready reservoir of hot water just like a conventional gas water heater but is much more efficient because of how heat is transferred from the energy source to the water. A condensing heat exchanger has more surface area than a conventional non-condensing heat exchanger, enabling water condensation from flue gases. This process captures more heat, greatly improving efficiency. They also have more efficient burners, heat exchangers and better insulation.